I bought a blueberry bush today. Couldn't resist with my new-found green thumb. And, well, I thought it might be a good idea since my son and I love them so much and they're just so expensive. The plant was only eight bucks so why not give it a go, right? Blueberries don't usually stick around very long here, but if by chance there are any sitting around after a few days, I'll use them up in a recipe before they go bad. 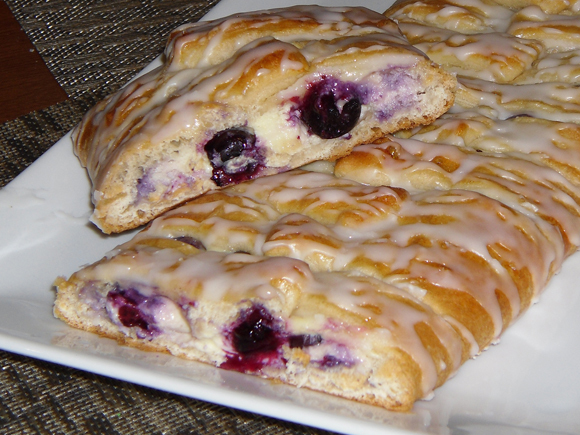 I love to use blueberries in cooking and baking soone day, a coffee cake sounded good. I was also looking for something easy so I thought I'd use the crescent dough can that had been lingering in the fridge. It seemed like it would work really well since it bakes up nice and flaky so I worked out a couple ideas and ended up with this super easy, super yummy dessert. It's bursting with blueberries and the cream cheese mixture bakes up nice and creamy while still holding everything together. It's also much easier to put together than it looks. I included step by step pictures below so you can see the process. And, hey, the wonderful thing about crescent dough is that you can always pinch it back together if you cut wrong or make a part the wrong size. It's very forgiving, but don't play with it too much or it won't rise properly when you bake it. Tip: make sure you use the crescent sheet instead of the crescent rolls. You'll have to spread things out too much and manipulate the dough too much with the rolls so you won't get nice, flaky finish. 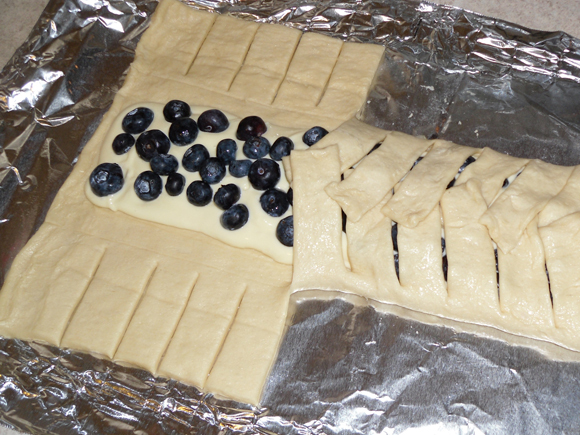 Next, you'll fold over the strips to cover the blueberries. Take one dough strip and fold it over at an angle. Take the opposite side's strip and fold it over so the edge goes slightly over the first strip. Keep alternating until you've reached the end. When the cake is nice and yummy, golden brown, let it cool and then drizzle it with icing. The filling for this recipe makes enough for two cakes but since you can't cut an egg yolk in half, I have to write out the whole thing for you. You can stick the leftovers in the fridge and use it for something else. (Muffin filling?) It will keep for about a week to a week and a half. Or maybe even make two cakes and freeze one? If you do that, please comment how it works out. 2. Beat filling ingredients together until smooth. Set aside. 4. 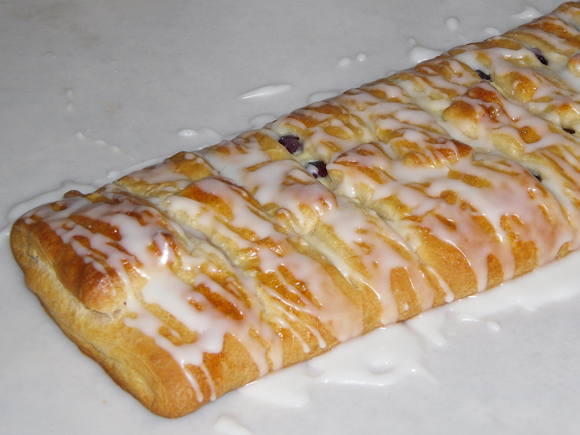 Cut 1" strips about 2 1/2 - 3 inches high along each long side of the dough. 5. Spread half the cream cheese filling in the middle between the strips. Leave about a 3/4" border on each side of the filling. 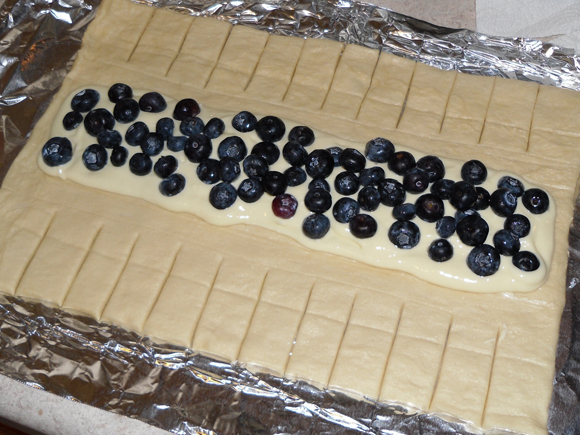 Scatter the blueberries on top in a single layer. 7. Bake for 13-15 minutes or until golden brown. 8. Cool completely then drizzle with icing. I was checking your photos, and let me tell you that you really take care of all the details... that's great. I love to cook desserts, almost everyday, so I think I will try yours for sure! Thank you, Clarisse! If you try it, please let me know! Thanks for trying out the recipe, Sofia! I would have never thought about pizza dough! I'm glad you liked it so much! Crescent dough is like your danish dough. I made this recipe for my husband for breakfast this week. We both loved it. Word of caution though, you really have to make sure the crescent roll dough cooks completely. The egg wash does cause the dough to brown quickly which makes the pastry look 'done" when it is not. Just be careful to check. I will definitely make this again! Please explain to me where the 'coffee' part of the cake comes from. Its a breakfast pastry usually served along with coffee....coffee is not included in the ingredients. It's more of a serving suggestion. U say to spread half the cream cheese filling, scatter the bluberries and then start folding the dough over. Where does the other half of the cream cheese filling go? That looks wonderful, really mouth-watering! I love blueberry, so this is a really great recipe for me!